Still in Budapest, Robert Pattinson was back in the tux again filming outdoor scenes under artificial rain. We even get another glimpse of costar, Kristen Scott Thomas! 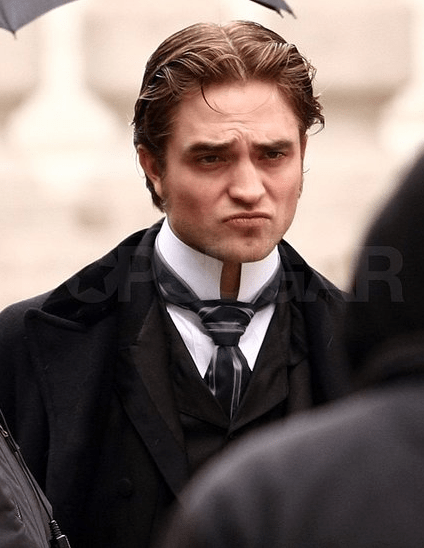 8 Responses to "Photos: Wet Georges on the set of Bel Ami"
Oh my word…can I say Gorgeous Georges?? They’ve really tamed the eyebrows. Sigh. All of these pics are just beautiful. He looks so exhausted, I hope it’s just a very good make up job :(. He is still gorgeous but very tired. Thank you, thank you, you wonderful people for making these available to me. Isn’t it wonderful to be so close to the process of filming, and watching the glory that is Robert Pattinson. Know he must be nearing exhaustion, he’s had such a grueling schedule for so long! don’t you think is is strange that kristen stewart is on set? what? the guy can’t work alone?? it’s a shame Twilight follows him everywhere he goes. It’s no wonder the guy hasn’t lost it completely. she is like a clinging vine, so clausto ew.